butterPreparation:Choux pastry: boil 250 g of water with butter and a pinch of salt, then pour in the flour all at once and, stirring constantly, keep the dough on the fire until sfrigolerà and detaches from the pan, then transfer it into Electric s bowl, let cool then, with the whip hook, mix in eggs, grated cheese, a pinch of paprika ½ teaspoon baking powder. Gather the dough into a large pocket of fabric with mouthpiece, spizzata, and let him out on a baking tray covered with baking paper forming, with the cutting edge of dough that will drop from the nozzle, 12 rings rather narrow (the center of the rings will end with the swelling of the dough); bake at 180 ° C for 30 '. Filling: mix the ricotta with minced shallots, fried with butter and parsley. 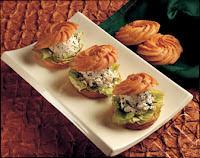 The warm choux stuffed with lettuce, cottage cheese and serve.